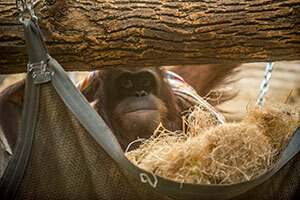 The Milwaukee County Zoo is proud to announce its newest addition, a female orangutan, Rayma, is now on public exhibit in the Primates of the World building. 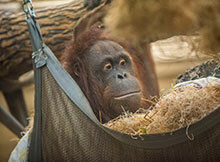 Rayma is an 11-year-old Bornean orangutan arriving here from the Topeka Zoo as a companion for resident male orangutan, Tommy. Zookeepers comment she is very sweet and gentle with animal staff and Tommy. She is quite curious and likes to stand on top of large enrichment items such as plastic barrels and “walk” with them by propelling herself forward by rocking back and forth. She enjoys eating different fruits and vegetables, but seems to favor oranges the most! Keepers provide bubble bath, bedsheets/blankets and boxes and bags for her to interact with, in order to keep her mind active and healthy. Not long after Rayma and Tommy were introduced, keepers observed some play behavior, grooming and even food sharing between them. In their native Indonesia, both Bornean and Sumatran orangutans are threatened due to deforestation caused by the harvesting of palm oil. Palm oil is found in many common products such as soaps and snack foods that people consume every day. Bornean orangutans specifically recently have been declared critically endangered. For more information, visit redapes.org.